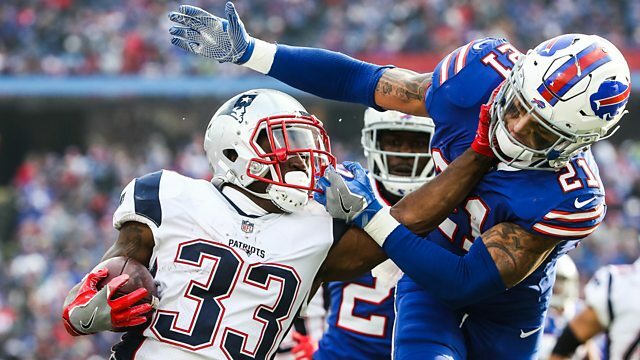 Mark Chapman, Osi Umenyiora and Jason Bell run through extended highlights from the weekend's action, including Buffalo Bills v New England Patriots. Browse content similar to Week 13. Check below for episodes and series from the same categories and more! the ball up the near side. Looking down field, going deep. A one man wrecking crew. Oh, and caught, for the win. We thought what a great idea! Seems a bit too happy about it! with the new, I say. presenting gig on the show! pundit who's won a Super Bowl. who has not won it! I have never seen this before! I love having you on the show. a plane to do this. He loves being on the show so much. picture coming into week 13.
the number 1 and 2 seeds. and will fancy their chances. rounds of games to go. and truly still in the mix. at the top in the NFC South. Ingram still going, down to the 11.
to run the ball through. Had his hands on it inside the 40. But couldn't hold it in. Here is a drop by Palardy. and all kinds of stuff. Drew Brees steps up, touchdown. how do you lose sight of him? Caught for the first down. And just a blown assignment. Everybody else was on a man. and no one goes with him. he has got amazing speed. the end of this run. once he gets the ball. and then it's just sheer power. And he blows right through Coleman. Clay from inside the 45. And a tackle from behind. And it belongs to the Saints. and this week, not so good. field goal to lead 31-14. COMMENTARY: Under five to go. Newton has to pull it down. Cuts across the field and at 25. A 31 yard carry by Cam Newton. unable to get a hand on it. Here is play along the sideline. who they are going to give it to. it went out of bounds? to Carolina at the moment. player was out of bounds. Therefore it is a free kick. COMMENTARY: Out on the edge. And has a first down. Another big one for Kamara. Leaps down inside the 30. South at nine and three. We have an extremely tough division. are all vying for the top spot. game than the next game. football needs to be played. We will learn from this. doesn't stop when Carolina lose! horrendous for all of us! given the state of the division. not to give it away. to beat your rivals at home. Huge win for New Orleans Saints. about a little bit on this show. He is, because he can do it all. He can run between the tackles. He can get outside on the edge. up against, they are very talented. with him, taking a lot of load off. they lean on the run. for a guy like that. time he gets the ball. he is the work horse. was for them years ago. There is a real balance there. in and changed the pace. could run in between the tackles. of his game, not just one area. the load off him a little bit. Will he find next year harder? to who he wants out there. what the defence tries to do. Why did he go so low? all our money behind you! I mean, it is hard. as a starter in college. I got picked in the second round. go in the first round. to the second, third rounds. and they have got to go to Atlanta. that is a huge loss. is such an emotional player. that team is typically winning. When he is not, they're not. with an extremely strong game. to have their hands full. to week 14 with some special guests. after Match of the Day. of the other week 13 games. the Vikings and the Falcons. and took down the Falcons. a friend in your book! for television, calling this game. after a three-week injury lay-off. He had an awful second quarter. to Dean Lowery to put them ten up. in until Rogers gets back. there winning it in overtime. And the Packers go to six and six. You do wonder how that was not seen. Because he's a big lad. on top of the NFC West. He has now had four in the last two. to run the ball there! Tre'Davious White picked Tom Brady. bit more in a moment. The Patriots are now at ten and two. just decided not to tackle him! He didn't even touch him! that and a huge hit. I love Case Keenum, I do! guy on All Or Nothing. He has been much maligned. And he is in a great system. for the nice guys sometimes. You know I'm a Minnesota fan! Case Keenum seems like a nice guy! happy that you said that. I mean, I like the guy. he is versus the pressure. the third down from Atlanta. They are good on every single level. Rush, linebacker and also secondary. we think he is a great person. have a conversation about nothing. I said that about Alex Smith. We're going to move on! that is all I'm going to say. plays and getting him the ball back. that is going to happen? And he's got a great defence. and he will do it well. I'm just looking at the date! I am rolling with this! The first involves Tom Brady. Josh McDaniels, during the game. through the voice now of Tony Romo. like, oh, he was open. I know he was open. You know what, I know he was open! Do you like the arguments sometimes? That is what is happening out there. That is a little bit of a laugh. He has got a one match ban for this. or not, I don't know. I would use to describe this. think he is a coward. we not out here playing the WWE. This is a national Football League. you might have got locked up. who was lying on the ground. you're competing in your intensity. are not out there hurting someone. he was out there wrestling. of your brother out there. OK, onto the next game. and Carson Wentz of the 10-1 Eagles. they were the young upstarts. The wheels of history are turning. champions of four seasons past. Carson Wentz and the Eagles. Today, Wentz or Wilson, we will see. COMMENTARY: Ball at the 11. Within seconds of the quarter. hot in the red zone. It was 10-3 going into half-time. COMMENTARY: And Wentz off to fake. inside the five yard line. across the line with the ball. going to rule a touchback. in the field of play. the ball go out of the endzone. if you are the Seahawks here. to Clark to get it out. Richardson stripped it out of there. Doug Baldwin, to the endzone! quarterback to make that throw. Did that foot hit the ground? Does he get it in? at the one yard line. It will be Seattle's ball. 1st & goal at the one. Wilson looking for a win. a 3rd and goal and in they go. You see Mills and it wasn't a pick. to move your way through there. Wilson saw it all the way. Only a three-man rush this time. The pressure put on Wentz. They almost get him from behind. pressure, the 51 yard gain. about 45 yards down the field. thought he could throw it that far. set to the left side. throws to the end zone. Caught, Agholor for the touchdown. Another 3rd down here, 3rd & 9.
to flip the ball to Davis. that it was a forward pass. least right down the line. Let's see if we can get any marks. and that was too easy. by 14, you've got 5.48. Pressure again, fires too high. in for the sack, so it's 4th down. Three receivers set to the right. going to air it out again. tonight but he has the final answer. of the Legion of Boom. I love it, I hope you guys did too. and we always find a way. I think we'll be just fine. now they've got Wayne Brown, though? protection on the left side. that easy for everybody else. So it's special, what he's doing. of the offense, as he goes, they go. he can't have a bad game or play. You said it's a quarterback league. showed his special magic as well. that's what makes him special. for the rest of the run. who would you lean towards? who are older than him. as I go, this team goes. I'd go with the Eagles. If they are in Philly. the season 5 wins from 5. It's a long story, Greg! coasting in the AFC West. have described him in recent weeks. Fake it, Smith has time. Touchdown number six on the season. six points the first half. They already have a touchdown here. Deep ball, got a man, it's Kelce! A rainbow delivery from Smith. offense from the first five weeks. and he's in, touchdown, Jets. connection on the deep ball. touchdown and they get it. minutes left in the third quarter. the ball in this second half. dominant in favour of the Jets. as he goes blowing past Robinson. Fastest player in the NFL. 2nd & 8 Connor Smith. again and Number 10 is going to win. Clayborn's eyes are on the ball. the Jets back in front. 21 yards, curling it through. points off the board, though. No, it's a personal foul. They hit the center snap. Logan with a personal foul. The 14th play of the drive. to peel off the pile. Indicating they'll go for two. try here for New York. McCown, nothing on that side. A flag ended up in the stands. Peters is being escorted off. the distance to the goal. The ball is starting inside the one. The Jets are going for two. and getting the angle for two. Kelce set up by himself. would have ended the game. The Jets are trying to end it here. Fourth and six for Kansas City. Nobody home and it's over. Kansas City a damaging loss. until the wheels fall off! out a game, all right! game-winning drive from the Jets. on that drive our down to like 20%. the flag into the crowd. game with a big grin on his face. and calamity sums up the Chiefs. Yeah, he'd tabbed out of that game. corner on the other side. was having a horrendous game. anything about it and he cracked up. He did that in college. you'd be fuming with him. what to do after that! I picked up the flag. I didn't know the penalty for that. he was going to get tossed. it starts to look like this. At the expense of Eli Manning. for Oakland with this 51 yard run. in the AFC West hunt. because he had been sacked. ten catches for 105 yards. He is balling this year. closing in on the Chiefs. on top against the Colts. and a couple of touchdowns. That one to Keelan Cole. That pick in the fourth quarter. conceded ten points or fewer. that 75 yard touchdown to seal it. and it will go well. to blow up on Sunday. them in the end 44-20.
and they are the league leaders. with two former Giants here. to get rid of Ben McAdoo? with you on the show! We've had lots of fun. I liked where that was going. Obviously it was the right decision. the best season this year. he's given them 14 seasons. I thought it was the wrong decision. so having to show his authority. for him for a little while. you know, let's slow down. been able to do that. Again, that's a tall order. With all of the weapons he lost. a way to get some wins. guy than a head coach. to do the AFC West. and they are streaking right now. I agree with my friend over here. a special player in this league. done at the right time. with the defense that they have. playing well on defense right now. earlier in the season to now. is where their strength is. as the AFC East is concerned. it's a three-way tie in the West. but only a matter of time now. Too close to call this one. New Orleans at Atlanta on Thursday. could decide who is number one seed. from the top of the AFC West. move ahead as the number one seed. The big change here is Seattle. at the expense of Atlanta. New Orleans will be their visitors. We always appreciate having you. It isn't a dig at you! Come and see us any time, seriously. VOICEOVER: Playing for the playoffs. Playing for your place in the mix. playing for your place in history. It is week 13 of the NFL season and Mark Chapman, two-time Super Bowl winner Osi Umenyiora and former NFL corner Jason Bell run through extended highlights from the weekend's action. With the playoffs nearing, teams across the AFC and NFC are making the final push for post season. The reigning Super Bowl champions New England Patriots go head to head with divisional rivals Buffalo Bills in upstate New York looking to extend their season into January.